When I picked up and shot the Honey Badger SBR for the first time, I realized how great looking the gun was overall, but it packed a serious punch. It reminds me of a beauty pageant queen who occasionally likes to commit domestic violence during an argument. The gun is fantastic looking with a goldish semi shine finish that looks tactical but Gucci all at the same time. The overall set up feels familiar to anyone who has trained on an AR15, but once you open it up, the similarities start to fade away. The Q Honey Badger says no thanks to traditional thinking and decides instead to take the high road by doing its own thing which works for the most part. The collapsable stock looks sleek and elegant, but if you don’t hold it tight, It’ll turn into the abusive partner on your cheek bone. I was shocked how lightweight and agile the gun was overall since its made out of lightweight material the gun is a dream to run and gun with. We had a blast running movement drills with it and doing target transitions quickly. Once you get use to the recoil impulse it does become manageable and doesn’t beat you like a red headed step child anymore. The Honey Badger is one of the few guns on the market that makes you feel like a movie star at the gun range. It’s not the uber tactical choice like many options out there but rather a movie star fighting the evil villian made of paper at the range. The gun makes you feel like shooting it is a special event which I haven’t had since the Coonan 357 Compensated 1911 or a full auto belt fed. I’m not surprised to hear the gun has a several month wait but it’s worth it in my opinion. The gun has its flaws don’t get me wrong. It’s almost impossible to keep clean of carbon and grime. 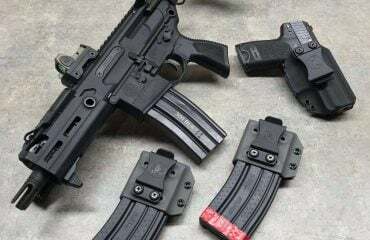 The gun also does not handle recoil the best compared to something like the Rattler which is heavier but it tries despite being so lightweight. The gun is also picky when it comes to magazines so if you have a stockpile of certain magazines, they may not work with the Honey Badger. 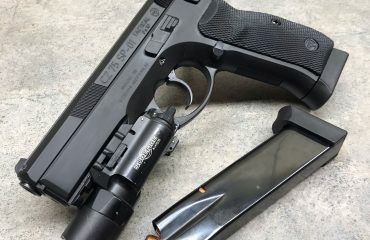 The trigger was very light and I would be concerned carrying it in a bag with that light of a trigger, but at the range it felt great. It was a crisp clean break with a very short but positive reset. The M lok handguards are very low profile as well but looking at the gas block, I’m not sure they are all useable in the current set up. The gun is a minimalistic take on what a PDW could be and for that I respect it. Sig went the other way and built an almost 7 pound tank where the Honey Badger went with lightweight and mobility to cut down on size. Overall, I think the Honey Badger is one of those guns that has a soul, its charismatic and even though it may not be perfect, it owns those flaws and frankly doesn’t care. It honestly feels special and for that I respect it.In a lot of ways it’s the beauty queen that cant resist a good fight at the bar because it’s a good time. I really do think the weapon guys on the new movie Peppermint did a fantastic job picking the Honey Badger for Jennifer Garner as a badass SBR to do serious work with. It looks fantastic and although I probably wouldn’t carry it for self defense every day, I would gladly take it to the range for the huge smile it makes you have when shooting it. If you picked it up I say you did well. If you guys have any questions or comments feel free to leave a comment below or send me an email, and remember stay safe out there. 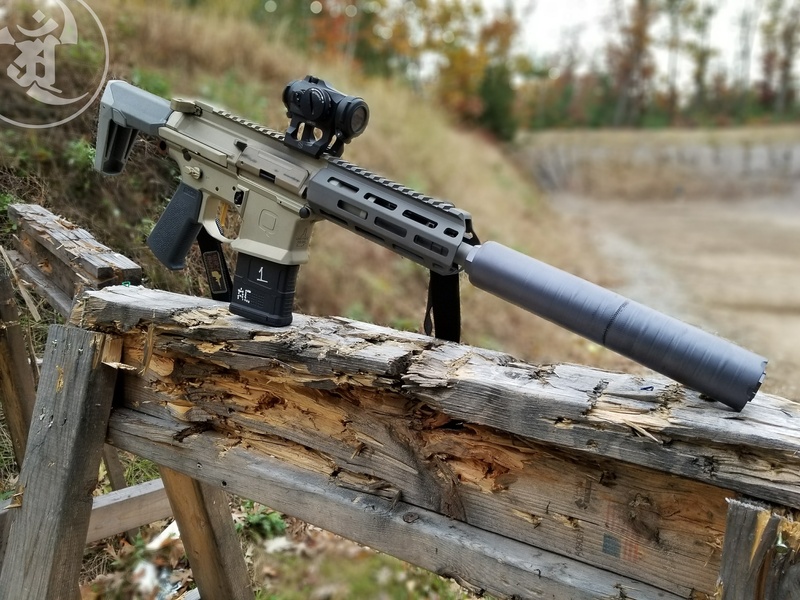 When I picked up and shot the 300 Blackout Honey Badger SBR for the first time, I realized how great looking the gun was overall, but it packed a serious punch. It reminds me of a beauty pageant queen who occasionally likes to commit domestic violence during an argument. The gun is fantastic looking with a goldish semi shine finish that looks tactical but Gucci all at the same time. The overall set up feels familiar to anyone who has trained on an AR15, but once you open it up, the similarities start to fade away. The Q Honey Badger says no thanks to traditional thinking and decides instead to take the high road by doing its own thing which works well for the Honey Badger. The collapsible stock looks sleek and elegant, but if you don’t hold it tight, It’ll turn into the abusive partner on your cheek bone. I was shocked how lightweight and agile the gun was overall since its made out of lightweight material the gun is a dream to run and gun with. We had a blast running movement drills with it and doing target transitions quickly. Once you get use to the recoil impulse it does become manageable and doesn’t beat you like a red headed step child anymore. 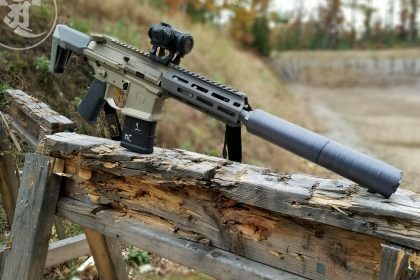 The Honey Badger is one of the few guns on the market that makes you feel like a movie star at the gun range. It’s not the uber tactical choice like many options out there but rather a movie star fighting the evil villain made of paper at the range. The gun makes you feel like shooting it is a special event which I haven’t had since a full auto belt fed. I’m not surprised to hear the gun has a several month wait but it’s worth it in my opinion. The gun has its flaws don’t get me wrong. It’s almost impossible to keep clean of carbon and grime. 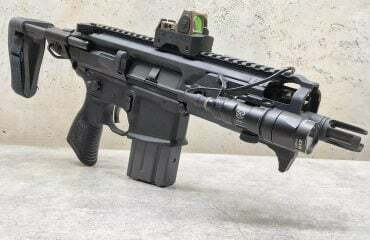 The gun also does not handle recoil the best compared to something like the Rattler which is heavier but it tries despite being so lightweight. The gun is also picky when it comes to magazines so if you have a stockpile of certain magazines, they may not work with the Honey Badger. Overall, I think the Honey Badger is one of those guns that has a soul, its charismatic and even though it may not be perfect, it owns those flaws and frankly doesn’t care. It honestly feels special and for that I respect it. In a lot of ways it’s the beauty queen that cant resist a good fight at the bar because it’s a good time. I really do think the weapon guys on the movie Peppermint did a fantastic job picking the Honey Badger for Jennifer Garner as a badass SBR to do serious work with. It looks fantastic and I would gladly take it to the range for the huge smile it makes you have when shooting it. If you purchased one I can say you did well. If you guys have any questions or comments feel free to leave a comment below or send me an email, and remember stay safe out there.